Dublin Business School student and our ambassador for Pakistan, Farrukh Abbas, tells us why Ireland was the right choice for him. Ireland has a diverse culture and regardless of your interests, you should find a community where you can meet like-minded people. My name is Farrukh Abbas and I am in my final year as a Business Information Systems student in Dublin Business School. After completing my Leaving Cert, I decided to travel to Ireland for my further studies in Information Systems. Ireland is one of top destinations in the world for both business and study — It has rapidly established itself as the leading technology hub in Europe. 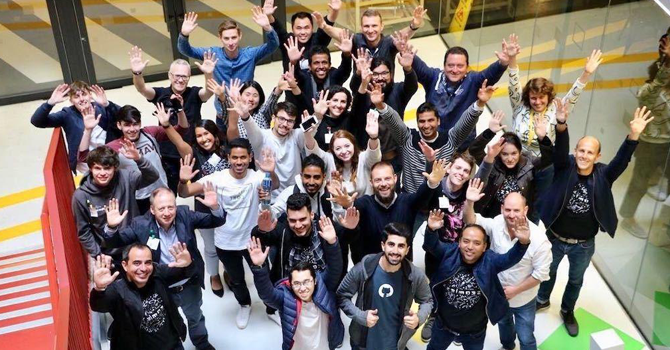 It is home to nine out of ten of the world’s top global software companies, and offers a world-class ecosystem comprising of both local and international tech talent, as well as being a gateway to Europe. Ireland is ranked first in the world for both quality and value of inward investment — in fact, ten of the world’s top ten born-on-the-internet-companies have chosen Ireland. They chose Ireland not only for the competitive tax rates but also because it has a stable pro-business government with easy access to a young, dynamic and highly educated workforce as well as a strong commitment to the EU. So why is Ireland the best place to study for IT students? Let’s dig into it. As Ireland is such a geographically small location, it is easy to meet people. Regardless of the topic — whether it’s about weather, location, what colour they like, how the food in that restaurant was etc, everyone is open to answering all sorts of questions and will always give you the most thorough response they can. Most of the tech companies such as Google, Facebook and Microsoft organise networking events that are open for everybody, where you can attend and meet different people from different backgrounds. I have personally attended many events and have met lots of different people with different backgrounds such as engineers, recruiters, marketing executives, accountants etc. These events can be a great opportunity for students like us, which might open the next door in our career. Ireland has great opportunities to network and connect with people who might become investors, advisors or employers. Ireland has a very pro-business environment, which companies like. That’s the reason why tech companies, for example, that set-up 20 or 30 years ago are still here. Although, they have morphed and changed the nature of their activities to keep up to date, which is a great advantage for international students. If you are bored or need some time off from your studies, that’s not a problem! Ireland has got you covered. Ireland has a number of beautiful and historical places to visit. Trim Castle, Dublin Castle, Connemara (Galway), Cliffs of Moher are great places to start, to name but a few. It is always good to take some time off and visit different places, which will help you both physically and mentally. 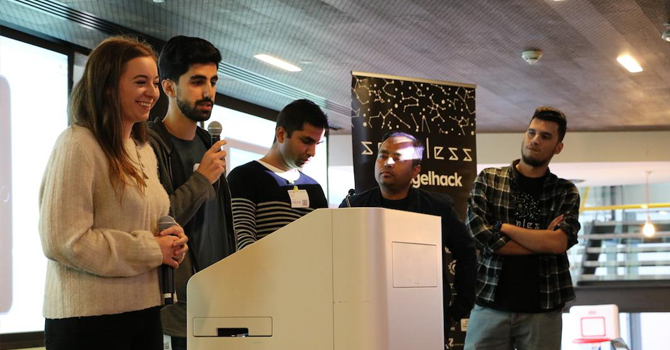 1: Angel Hack Challenge — Making something innovative without limits; something that brings about a positive change to the world. 2: Google’s Smart City Challenge — How might we make smart cities like Dublin be more inclusive? Our team decided to work on the Google’s Smart City challenge. We only had 48 hours to create and establish our finished product. We named our product “Smart Nav”. The purpose of our product was to create touch screen booths across Dublin City. These booths would enable commuters and tourists to navigate through the city and to find the most secure and fastest route to their destination, and also which routes to avoid. It included different travel modes and SOS button in case of any emergencies. My role in the project was as the UI/UX Designer, as well as the Front-End Developer. It took us about 42 hours to develop and code our prototype and the rest of the six hours to prepare our pitch and present it in front of the judges. We were confident about our product as it met the aspects of the judging criteria. Everyone pitched great products and ideas but luckily, our product Smart Nav won Google’s Smart City Challenge. An unforgettable moment! The journey so far has been one filled with joy and opportunity. The most valuable things I’ve learned from my experience is the importance of making connections. Today’s tech world relies heavily on collaboration, and the support of people in your team and around you too. While developing this product, I had to attend dozens of meetings, where decisions had to be made. Sometimes, they weren’t what I thought was best for our product but it was my duty to the team to respect their decisions, and to put trust in their competencies. This is something that you cannot learn within a class environment.